Friends, I am so very excited to share with you my vegan soap recipe today! It is a recipe I have been experimenting with for several months now, and at this point I am very happy with the way the soap is turning out. I also worked with Brazilian clay this go round, and I am thrilled with those results as well. 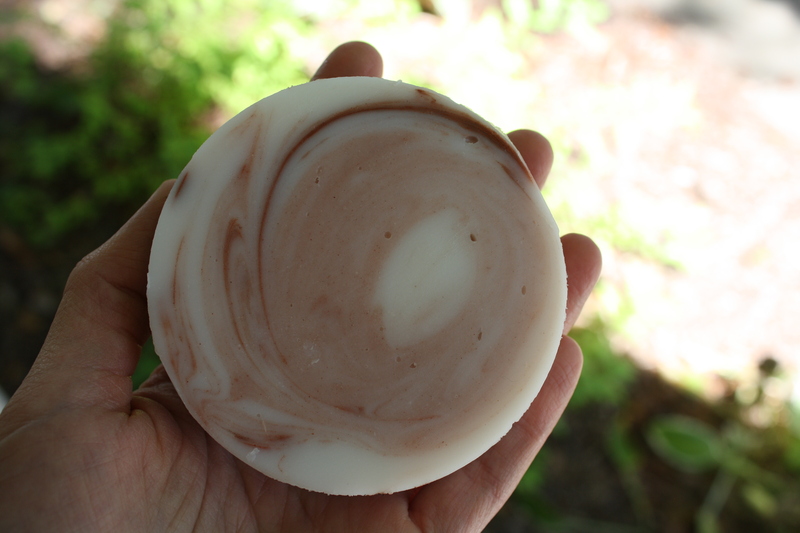 This soap recipe has been a gradual evolutionary project for me. When I began making soap many years ago, I used a melt-and-pour base to which I added essential oils, herbs, and other fun things. I then moved on to making my own cold-pressed soap using a combination of lard and coconut oil. My struggle with making this type of soap was that at times when I did not have access to lard from a pig in which I knew the farmers that raised it, I was using lard purchased from the grocery store. I had a hard time with this because I am so careful to consume (and feed my family) foods in which I feel confident in its raising/growing, and here I was, making soap that would go be lathered onto the largest organ of our bodies (our skin!) and I didn’t know where it came from. I started to seek an alternative for our family during those months when we did not have access to local lard, and this is the result of those efforts. I hope you enjoy! Step 1: In a large stainless steel bowl, carefully stir the lye into the distilled water. Stir continuously until all the lye is dissolved. (This mixture can rise in temperature to almost 200 degrees, so again, proceed with caution.) Allow the lye-water mixture to cool to 75 degrees. This can often take several hours. Step 2: Warm the coconut oil in a stock pot until it becomes liquid. Remove from the heat and allow to cool to 80-85 degrees. Step 4: Once all the coconut oil has been added, I use an immersion blender to get the soap to reach trace phase (the consistency of a thick honey). Optional Step: If adding essential oils, blend the oils in at this time. And if adding clay for coloring your soap: mix a tablespoon of clay with .25-.50 mL of your chosen essential oil. Partially mix the clay into the soap mixture so it streaks. Step 5: Pour mixture into soap molds. Cover with plastic. I then place lots of old beach towels on top of the plastic wrap to help insulate the soap. Step 6: Allow your soap to remain insulted for 3-4 days. Then remove the soap from the molds, cut the soap (if necessary), and place on a cooling rack. 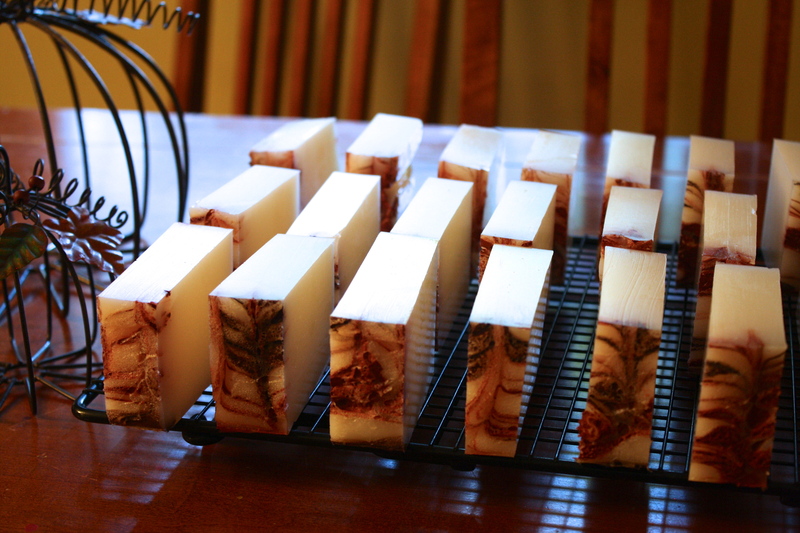 Step 7: Allow your soap to cure on the cooling rack for at least 2 months before using. This entry was posted in DIY, Recipe and tagged Bramble Berry, Brazilian clay, DIY, eco friendly, fresh, holistic, holistic living, home, homemade, homemade soap, homemade soap recipe, homemaker, homemaking, make, making, mama, mindfulness, mom, mother, organic, recipe, soap, soap making, sustainable, sustainable living, vegan, vegan soap, vegan soap recipe. Bookmark the permalink. You post the coolest stuff! I really don’t want to make soap, but if you decide to sell it… Let me know!